Our school is a reputable institution with an impressive history. Class instruction began in 1904 as a higher elementary school for girls and boys. It was very popular in Budafok as well as the surrounding area. During the Second World War classes were interrupted for several months. When classes resumed in 1945 it became an 8 grade primary school. The school has taken advantages of the advancements in public education becoming an English Section Primary School in 1978. The curriculum was further expanded with the advanced level teaching of Computer Studies in the 1998/1999 school year. On the 90th anniversary of its founding the school’s name changed to Kossuth Lajos Primary School. During its 100 years of operation the school has continued to develop in meeting the needs of its students and the community. Though our school is over 100 years old it has continued to grow and change while staying true to its purpose of educating and preparing students for life. 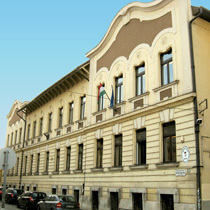 One of the results of this continuous improvement in education was the introduction of Hungarian–English bilingual teaching in the 2004/2005 school year.